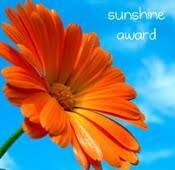 I want to Thank my wonderful blogger friend Ofelia at My Intended Life who gave me the Sunshine Award.She is so lovely and always finds time to visit me and leave such lovely comments. I’m suppose to share some things about myself and then pass the award on. I try to be healthy but have eaten 14 piece of cake/cup cakes in 3 days(well it was my daughter’s birthday). I held a dog by it’s collar today stop it geting run over,even though it was very heavy and scratch all my feet trying to grab another dog for 50 minutes then cried for 5 minutes after in shock. I love red wine ( but if you read my reader-profile you may have already guessed this). Wow, thanks, Claire! How sweet :).I'll have to think about what to share and who to pass it on to next. Dogs and children will always be confused why we won't let them do things that will really hurt them!